My husband Peter has a saying: “Whatever you do on the first day of the year, you’ll do the rest of the year.” In the past, my New Year’s Day often included a greasy hangover breakfast and bloody marys. Not necessarily what I want to be eating for the rest of the year. More recently, I’ve added black-eyed peas into first-of-January plate. 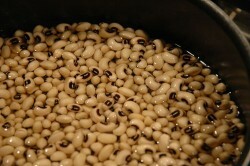 Black-eyed peas are a traditional New Year’s Day menu item in the south United States. It’s considered good luck to eat them today, and make a fine hangover cure when prepared with plenty of salt, pork fat, or smoked meat. Also, like most legumes, they’re packed with fiber and inexpensive too, especially if you start with dry beans. Make a big pot of black-eyed peas and you’re one step toward keeping your financial and diet-related New Year’s resolutions. , Black-Eyed Peas and Collards – there’s as many recipes for black-eyed peas as there are hangover cures.With so much variety, you can eat them all year long.